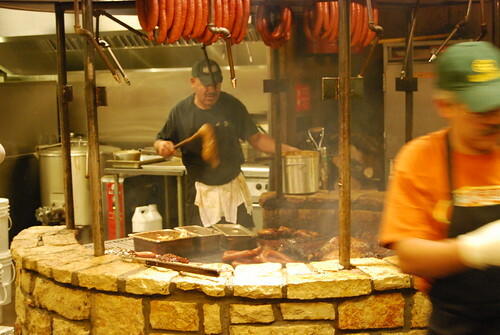 Since visiting Austin last year, I’ve been haunted with memories of The Salt Lick. We witnessed the infamous lines and made the right decision to place an order to go and skipped the hour-plus wait to be seated. My only regret about the visit was not bringing back a bottle of their BBQ sauce to enjoy at home, and since then I’ve been attempting to recreate it. Smoking pork ribs at home has been no problem with my stovetop indoor smoker. When at a BBQ restaurant, I refuse to order ribs when it’s much more cost efficient to make it at home. I rub the ribs with a seasoning before cooking and it’s ready to go. But replicating the BBQ sauce was different. I only knew that Salt Lick’s BBQ sauce was yellow due to the primary ingredient being mustard. I’ve played around with the recipe, substituting the amounts of brown sugar and sometimes replacing it with molasses. For an added kick, half of the vinegar can be replaced with beer. And the cheaper the beer, the better. 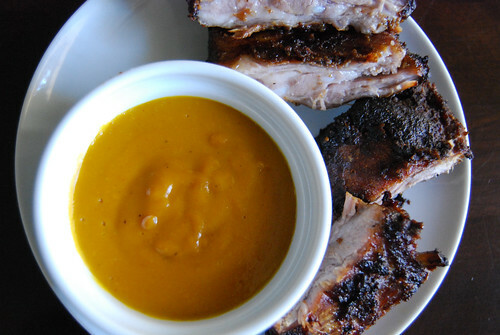 This recipe works best of made at least a day in advance to let the flavors meld. In a small bowl, combine all the ingredients and mix well. Store refrigerated in a tightly covered jar for up to 2 weeks. It’s so easy! You made ketchup so this would be a breeze for you. We might possibly be visiting Austin next Spring and Jake is already excited at the prospect of going to the Salt Lick. I haven’t seen a BBQ sauce quite like this one! Is this on the sweeter, or more vinegary side? While I have smoked my own ribs, too, haven’t tried making any of my own sauce yet. But I want to try! I think spring is the perfect time to go. It’s not too hot and starting to warm up. But the traffic is nightmarish! I hope you make it out there! Great job! I just made this, and it’s very close to Salt Lick’s BBQ sauce. Thank you! I think the SL BBQ Sauce has anchovies in it. My daughter’s son was found to be allergic to fish and she said they cannot use this. In Texas we found the Spicey SL BBQ Sauce at Trader Joes and HEB. I may request my local Publix store in Georgia to order it for me. I believe the bottles in the Texas stores were about $5 each. Amazon Prime will ship you 3 and cost you about $8 a bottlek. Here is the link.http://www.amazon.com/Salt-Lick-Sauce-Bottle-Laurens/dp/B00954NKP4/ref=sr_1_2_s_it?s=grocery&ie=UTF8&qid=1465159156&sr=1-2&keywords=salt+lick+bbq+sauce.